Now I have the basic skills to fly an aeroplane it’s time to put that to use and start going places! 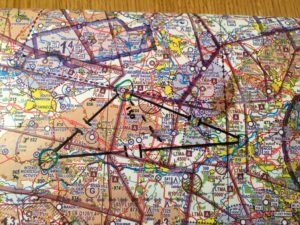 This lesson is to navigate from the airfield to Malborough, then to Grove and back to the airfield. We will pass through Beson MATZ so will need approval from them. We will also request a basic service from them so lots of new radio work for me! We spent nearly 2 hours plotting the route, going over the CRP1, planning the leg times and speeds from the F214 wind chart for today.